Doing my best to catch up with reality after an incredible trip to Cabo this past weekend and boy, it's not easy! The good news is, we're in the early days of summer. The bad news is, I'm still working on the bikini bod while stocking up on summer essentials. Lucky for me, I was just recently introduced to the new, limited edition Clarins collection to help me get through Summer in style. 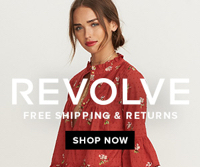 Surprise surprise, I'm sharing more favorites from Velvet's Summer line. 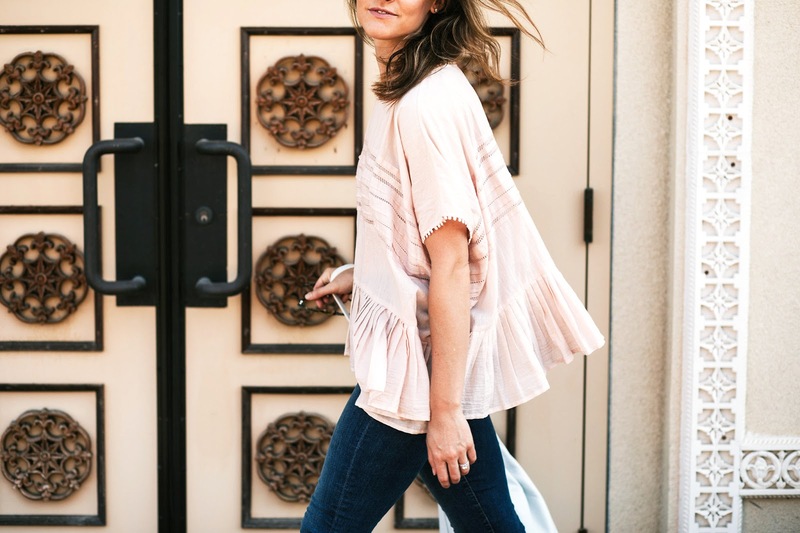 I'm currently obsessing over this easy breezy cotton top with gorgeous details like pintuck seams, mesh embroidery across the front, and a peplum bottom. It's so nice for anyone who can relate to having a "fat day" and you just want to wear something comfortable without being concerned with your figure. Did I mention it's super flattering? Cinco de Mayo and feelin' fly-o. Here are a few festive accessories that i'm currently obsessing over. Living in Los Angeles but you'd think I'm in a foreign country, right? I have to start off by asking honestly, how incredible is this temple? Fanny and I have recently gone exploring and she happened to stumble across this gem... If only you could see the inside of it. The details are stunning and the intricacy is jaw dropping. As of late, I've been completely obsessing over Velvet's Spring/Summer collection. 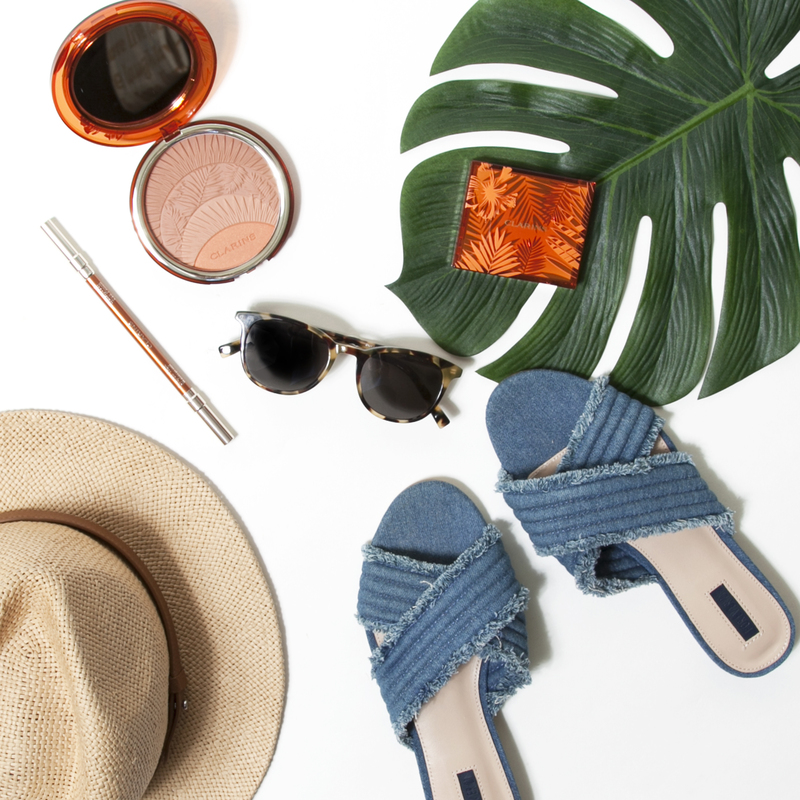 Known for their cotton basics, and boho chic flare, they stick to what they know- comfort. Speaking of comfort, I'm actually wearing this top right now as I write this, with a pair of boyfriend jeans and flip-flops. There are limitless ways to dress any of Velvet's pieces. I'd also have to point out how incredible their leather goods are. 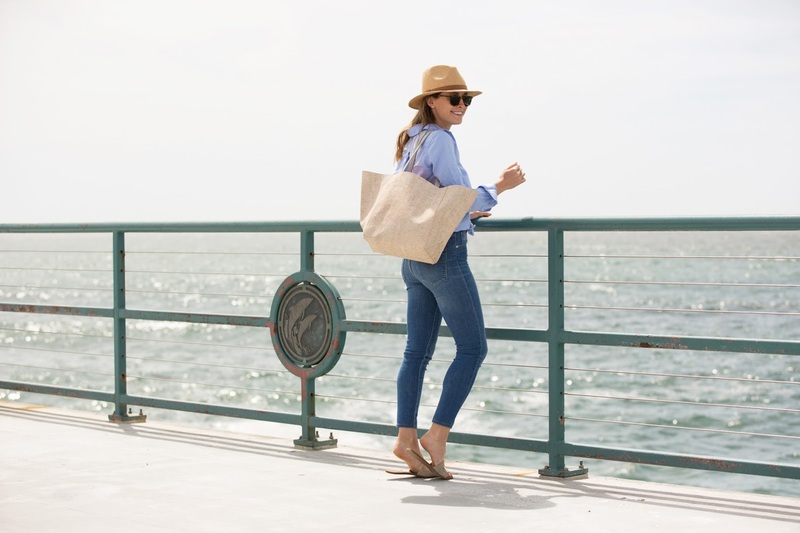 This tote is as smooth as a baby's bottom and wears really nicely. Not to mention, it holds a TON. Suffice it to say, I'll be wearing as much Velvet as possible this season. HELLO WARM WEATHER. It officially feels like Summer (but Spring) here in Cali. Super hot sunny days and cool nights... I could definitely get use to these vacation temps. With that, my current go-to top is this simple Oxford button down from Banana. It's super light weight and feels great in both warm or cool temperatures. 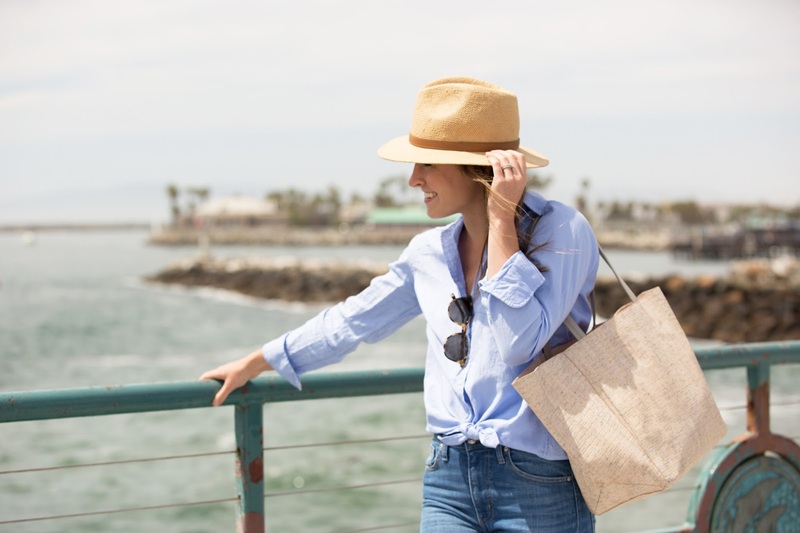 I'm also loving August's new, woven cork bag collection which accentuates West Coast sophistication for both on and off the beach. 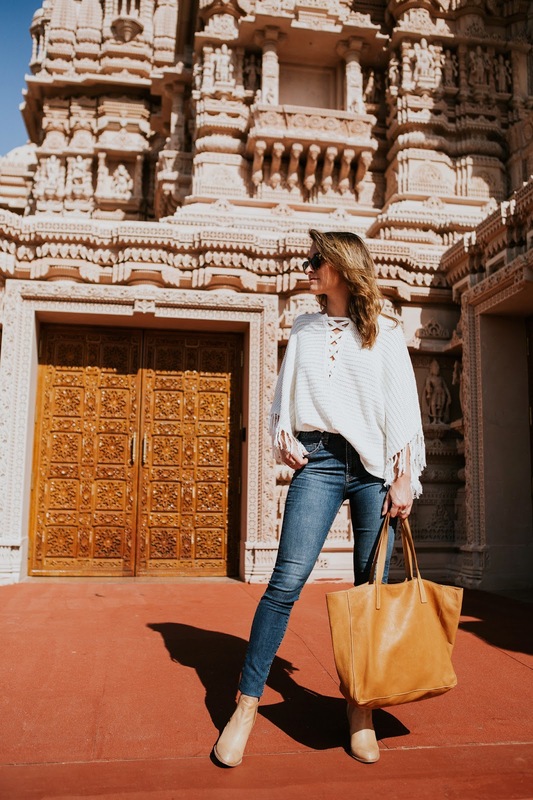 See below and check out how I took this look from day to night with just a few minor wardrobe adjustments- these are great tips for light packing travelers. This year, similarly to last, Matt and I have a bazillion different events to attend. We're at that age where literally everyone we know is either getting married or having babies. That said, our weekends are pretty jam packed and I'm constantly looking out for new wardrobe refreshers for everything. 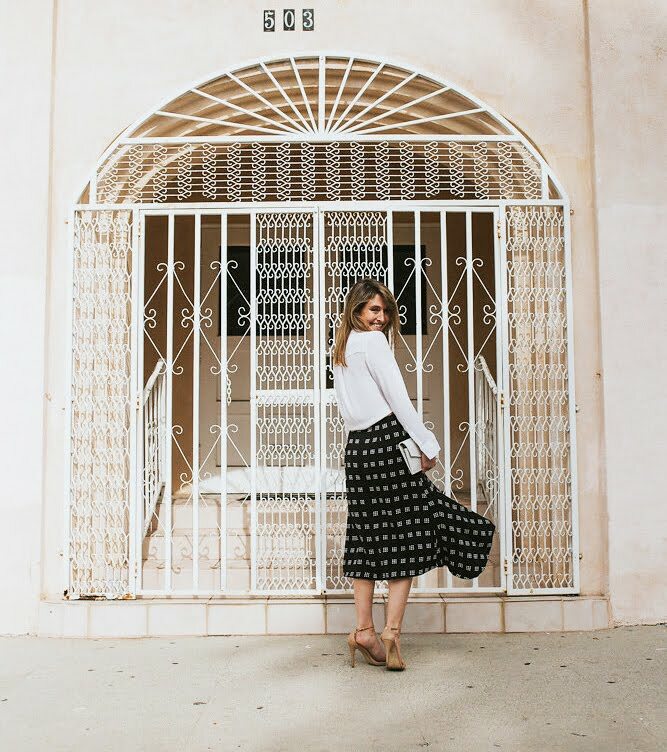 A dress for an event is functional and easy but if you want to switch it up a bit, why not pair a fun statement skirt with a simple blouse? I recently stumbled across this amazing skirt by C/meo collective at my favorite boutique in Santa Monica. Not knowing exactly where I was going to wear it didn't stop me from making the purchase. For a more conservative look, try pairing it with a simple body suit. The styling possibilities are endless!